Fashion is an essential element that defines your style statement. Be it terms of clothing, foot wearables or accessories, youth desires for the best to look every bit like a showstopper and rock the street like models. 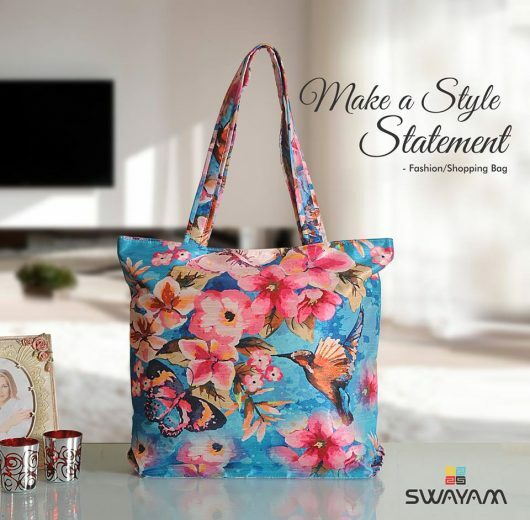 Flaunt your best carrying shopping bags from online portal of Swayam to present a confident and stylish personality to the world. Attribute it to powerful media or drastic changes in the fashion industry; there is passion among youngsters to fit into any type of occasion or events so they want to have highly functional bags to fulfill all their travel needs along with carrying stylish look. The collections of lifestyle bags are extremely exotic in look and functional in design. They embody a wide variety in terms of design and colors schemes that present a stylish look to the carriers. Patterns are embossed on a multitude of colors that splash a vibrant and lively ambiance to the linens. There is a special focus on floral prints as they are trendy and evergreen, and blend with theme like traditional, contemporary, and fusion for perfect overall outlook. Digital prints capture scenic beauty of Venice and city life; glamorous faces. The patterns are innovative, creative and highly stylish look would make the carrier feel a part of occasion and events where they flaunt their style. The matching handlebars help add five stars to the beauty of the carrier. The spacious compartment and multi-pocket storage let the carrier stock their valuable in its safe heaven. The wide width render uniform and equal weight and comfort while carrying the bag. The soft padded comfort of cotton fabrics enlivens a soothing feel to hand, shoulders and back where one prefers to hang them. To rock the street fashion like a pro, you may easily find and order for Swayam’s shopping bags online for a stylish and comforting feel.